Description Color Single Fact Multiplication Tables Worksheets: When you are just getting started learning the multiplication tables, these simple printable pages are great tools! 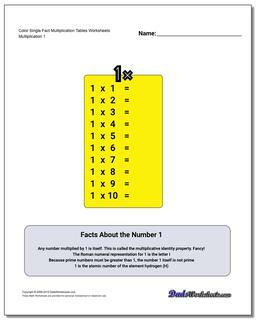 There are printable tables for individual sets of math facts, as well as complete reference multiplication tables for all the facts 1-12. There are table variations with and without answers, so you can use these as a study tool or as multiplication table worksheets. Once you know your basic multiplication facts, be sure to check out my complete collection of printable multiplication worksheets for more multiplication mastery!